Father Beyzym built all his life on Jesus. Father gave Him the lead on the difficult road of his religious and priestly vocation. He began to think about his future when he was twelve. He paternalised his younger sisters and brothers and willingly took care of them. He avoided trivial entertainments, shied away from dances and did not dress up! Father Beyzym did not spare himself but sympathized with the sick and weak. Being at the noviciate at Stara Wies near Brzozow, he eagerly visited the sick. He saw their needs and listened to their complaints. He cared for the students of Jesuit College in Chyriv. For many, many years his students remembered him. 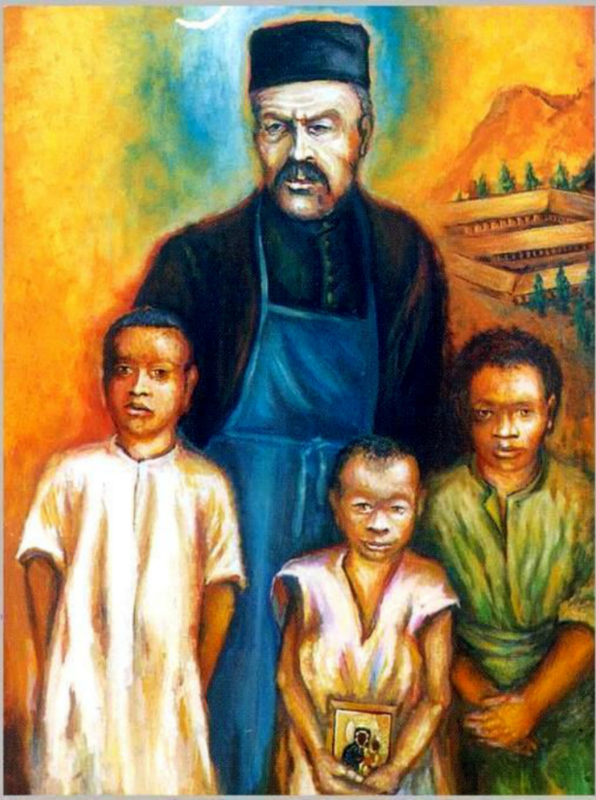 They supported his missionary work on Madagascar materially and spiritually years after his departure there. “Tatar”, as they called him, was determined and persistent in his decisions. For many years he had been waiting for the superiors’ (who delayed giving their permission) consent to work among the lepers. He was 48, when his ambition was fulfilled. In October 1898 he left Cracow to fulfill his mission, taking the image of Our Lady of Czestochowa with him. The image was with him to the end of his pilgrimage. Father Beyzym was not the person to lose heart quickly. He did not give up when, during his first years on Madagascar, he faced the tragic state of the lepers. He started thinking about the construction of a leprosarium for them. He needed the sight of money to achieve his goal. Father began to write hundreds of letters, especially to his compatriots, asking for monetary support for his enterprise. To his confreres, who tried to slack off his apostolic zeal, he usually brought forward the words of Saint John the Evangelist: “Let us not love in word, neither in tongue; but in deed and in truth!” It was not the mere activism. The Servant of the lepers’ activities were rooted in a deep devotion and the union with God. His faith of a child and trust in God’s care were his outstanding features. The most challenging issues he entrusted to Our Lady’s intercession and She never let him down. He used to say: “It is the Blessed Virgin who builds the hospital. It is She, who cares for it to be built!” Father Beyzym was absolutely positive that it was She, the Best Mother of Czestochowa, who took care of his “black chicks”. The year before his death, he died on October 2, 1912, the hospital in Marana was opened for its patients. It was built with money, sent by the Polish people from every corner of the divided country. “My poor fellows are constantly exposed to sin on the thousands of occasions, I would even say, out of necessity. I have been thinking not for once and not for ten times of how to remedy the evil, but nothing could be done unless there is a proper hospice with the care provided. They live like animals, all together, men, women, children. They must beg, i.e. sit near barracks by the pathway all day long, as they will not survive without begging. And it is known that idleness is the root of evil. They track around half-naked and so on, so forth… and to make a long story short, everything is bad, but I can do nothing to improve the situation in the existing state of affairs. If the people of the world knew what I felt looking at all that and being unable to help, especially, when I saw small children, who not only did not love God, but were simply unaware whether God existed, they had been learning to offend God from their parents, we would be showered with benefaction and the vitally necessary hospice I dreamt of would be erected”. Such testimony of the living faith, the fervent love and the great hope are needed nowadays so we should build our personal, social and family lives relying on God as a rock. We should not build without the foundation, without Christ! - John Paul II said in Warsaw in 1979. Building without our Savior, without relying on his merciful love, is worthless and useless! “I was busy with the retreats for my black chicks. We do not qualify for the deep asceticism, that is true, but I think, sink or swim, I have to try taking my poor things off the ground and getting them slowly closer to God as much as I can. As always, I entrusted this activity to the care of the Blessed Mother and asked Her earnestly to direct my words and the hearts of my poor dears, otherwise and it was as clear as a day, nothing would come out of my effort”. On October 2, 1912 our exhausted missionary went to Our Lord for His eternal reward. On August 18, 2002 John Paul II beatified the Servant of the lepers on Cracow Blonia. We are asking God for his canonization now.